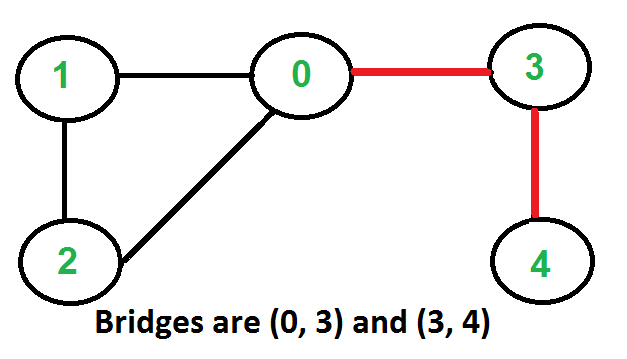 An edge in an undirected connected graph is a bridge iff removing it disconnects the graph. 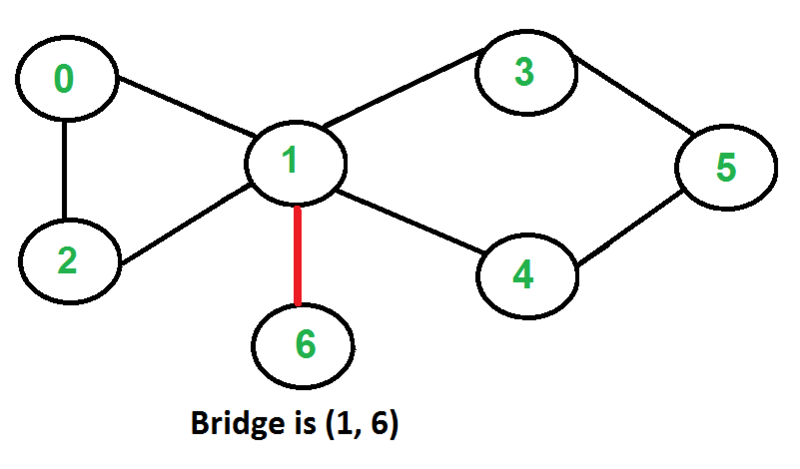 For a disconnected undirected graph, definition is similar, a bridge is an edge removing which increases number of disconnected components. Like Articulation Points,bridges represent vulnerabilities in a connected network and are useful for designing reliable networks. For example, in a wired computer network, an articulation point indicates the critical computers and a bridge indicates the critical wires or connections. Following are some example graphs with bridges highlighted with red color. 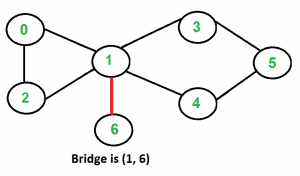 How to find all bridges in a given graph? A simple approach is to one by one remove all edges and see if removal of a edge causes disconnected graph. Following are steps of simple approach for connected graph. …..c) Add (u, v) back to the graph. Time complexity of above method is O(E*(V+E)) for a graph represented using adjacency list. Can we do better? The idea is similar to O(V+E) algorithm for Articulation Points. We do DFS traversal of the given graph. In DFS tree an edge (u, v) (u is parent of v in DFS tree) is bridge if there does not exist any other alternative to reach u or an ancestor of u from subtree rooted with v. As discussed in the previous post, the value low[v] indicates earliest visited vertex reachable from subtree rooted with v. The condition for an edge (u, v) to be a bridge is, “low[v] > disc[u]”. Following are C++ and Java implementations of above approach. // avoid use of static variable by passing a pointer. // Update low value of u for parent function calls. adj[v].add(w); // Add w to v's list. // of u in DFS tree and recur for it. elif v != parent[u]: # Update low value of u for parent function calls. print "Bridges in first graph "
print "\nBridges in second graph "
print "\nBridges in third graph "
Time Complexity: The above function is simple DFS with additional arrays. So time complexity is same as DFS which is O(V+E) for adjacency list representation of graph.